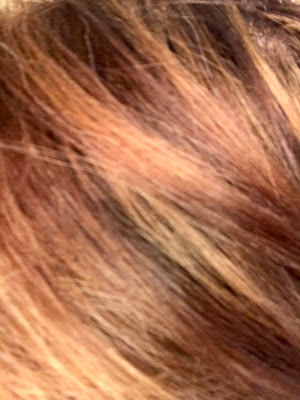 I get my hair colored and highlighted a few times a year, and I find it important to maintain my color in between salon visits. There are ways you can extend the life of your hair coloring and keep it looking its best. Here are some tips to help you keep your hair looking great! Washing your hair too often strips the natural oils in your hair. It also can fade your hair color if not done properly. 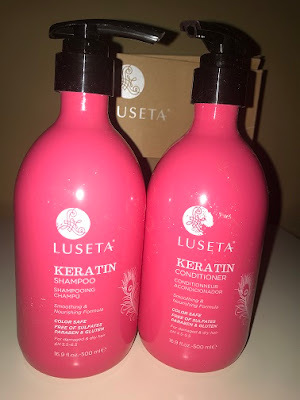 Products like Luseta Keratin Shampoo and Conditioner are designed for dyed hair. They are also sulfate, paraben and gluten free. I personally use these products and they not only work great on extending my color, but make my hair look really healthy as well. They are perfect for dry, damaged hair and help restore life to it. They have a light floral scent that isn't overwhelming and rinse nicely. Shampoos and Conditioners that are infused with Keratin can help you to maintain the strength of your hair and prevent damage from daily styling and exposure to harsh elements. By rinsing with cold water, you are closing the cuticle of the hair. I studied Cosmetology when I was younger and that was one of the first things I was taught. Warm or hot water open the cuticle allowing products and elements to penetrate the hair shaft. By rinsing with cold water at the end of your hair wash and conditioner you them close the shaft, keeping it protected. Think of it as a roof and the cold water being the roof shingles. Over drying your hair is going to cause it to lose its sheen and your hair color will start to fade. If you must blow dry it, do not keep it on a high heat setting. Also, do not hold it too close to your head. If you can, try to let your hair air dry as long as possible and blot it dry with a towel. The less time you expose it to heating tools, the better. Many times, the water in your home contains chlorine and other sediments which are not good for your hair or skin. Of course chlorine will strip you hair color over time. Try installing a shower head that has a water purification system built into it. Check out the benefits you can get from an Aqua Home Filtered Shower Head. ★ REVITALIZING BODY: Reduces dry, itchy skin, dandruff, and eczema. Cares about the skin, hair, and nails. Decreases the risk of developing asthma and bronchitis. I hope these small changes can help improve not only your hair color, but your hair and skin itself. Disclosure: This post was written with my best intentions to give you advice that has helped me personally. Always speak to a professional before using any products you are not sure of. This post contains affiliate links. Whenever I color my hair I don't think to use color safe products.